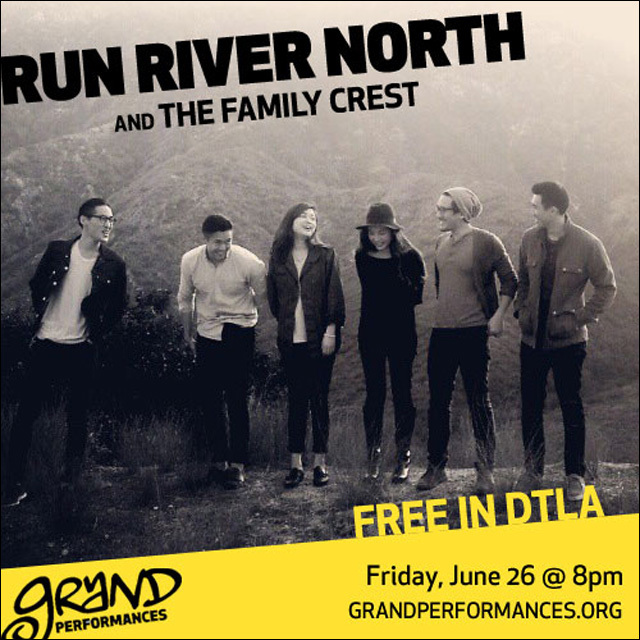 If you're in Los Angeles, you're invited to see one of my favorite bands, Run River North, as part of the free outdoor concert series Grand Performances. Come to downtown LA and enjoy the band's wild and warm indie folk sound. It's happening Friday, June 26 at Grand Performances at 350 South Grand Avenue. It looks they're doing a lunchtime show at noon, and then another show in the evening (with The Family Crest) at 8:00pm. This SF-based orchestral indie rock band, an NPR favorite, plays with boundless joy imbuing their songs with a combination of infectious enthusiasm and powerful talent. Thoughtful and uplifting anthems drive this Korean American indie folk rock band’s rhythmic drum beats, jangling guitars, and rapturous strings. It's going to be a fun show! And it's free! Grab some friends, bring a blanket and some snacks to share. For further information about the show, visit the Grand Performances website.